Random House, U.S.A., 2012. Dust Jacket Condition: Fine. Signed By The Author On The Title Page. Signature Only. A First Edition, First Printing. Book Is In Near Fine Condition. Dust Jacket Is In VG Condition.Not Price Clipped. 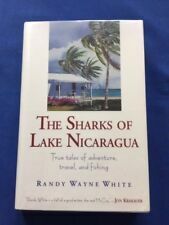 THE SHARKS OF LAKE NICARAGUA. ". Lyons Press. New York (199) First edition. SIGNED by Randy Wayne White on title page. Fine in fine dj. A BEAUTIFUL copy of this Randy Wayne White mystery novel. Book dealer second. I'm always out bookscouting and adding to inventory. Nicely SIGNED by White on front endpaper which is a map of "DOC FORD'S COUNTRY". A BEAUTIFUL copy of this Randy Wayne White mystery novel. Book dealer second. I'm always out bookscouting and adding to inventory. Nicely SIGNED by White on main title page. Beautiful First Edition copy of this Randy Wayne White mystery. Inscribed on main title page: "To Big Bob & lovely Dode ! / Randyl" & Signed by White. Book dealer second. I'm always out bookscouting and adding to inventory. Book is like new. Dustcover is in Fine condition. Book is in Fine condition. Hardback spine is NOT distorted. This is a Stated U.S. First Edition, 1st Printing hardback with 1-10 number line. No tears or creases on dustcover. Randy Wayne White. Ten Thousand Islands. A beautiful Signed/First Edition copy of Randy Wayne White's SHARK RIVER. Book dealer second. I'm always out bookscouting and adding to inventory. Signed by WHITE on main title page. Black Widow (Doc Ford). Author: White, Randy Wayne. First Edition with full number line. In protective mylar cover. Publisher: Putnam Adult. Release Date: 2008-03-18. Hannah Smith #4! Signed first edition, signature only on the title page! Putnam 1st edition, 2016, with complete number line. Remainder dot to bottom, not price-clipped. A BEAUTIFUL copy of this Randy Wayne White mystery novel. Book dealer second. I'm always out bookscouting and adding to inventory. BOOKS ALWAYS BOXED AND I ALWAYS BUBBLE WRAP. 25% OFF SALE - RANDY WAYNE WHITE 13 First Print Run/First Edition Books 2001 - 2012. Twelve Mile Limit. Tampa Burn. Shark River. Print Run: All are First Print Run of the First Edition Hardcover with full Number Lines in the years those were present. BLACK WIDOW by Randy Wayne White, signed, 1st edition/1st printing March 2008 G.P. Putnam's Sons. 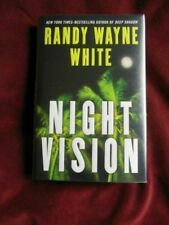 Beautiful First Edition copy of Randy Wayne White's NIGHT MOVES. Book dealer second. I'm always out bookscouting and adding to inventory. Book is about VERY GOOD unread (previous owner had taped mylar protective cover to boards that now have tape tears to surface from being removed, else book is NEAR FINE and appears unread). These books are used. There are lots of pictures of the actual book you will receive. IT'S A SCARCE SIGNED FIRST EDITION. THE ORIGINAL DUST JACKET IS UN-CLIPPED. THE DUST JACKET AND BOOK BOARDS SHOW LIGHT RUBBING AND EDGE WEAR. NORTH OF HAVANA. ". New York (1997) SIGNED by Randy Wayne White & dated in year of publication with the place "Ft. Lauderdale" noted on title page. Fine in fine dj. A Doc Ford novel. Haunted (A Hannah Smith Novel). Author: White, Randy Wayne. First Edition with full number line. In protective clear mylar cover. Release Date: 2014-08-19. Qty Available: 1. BATFISHING IN THE RAIN FOREST. ". Lyons & Burford. New York (1991) First edition. Near fine in fine dj. (Slight trace of foxing at edges.). Series: Doc Ford Novels. Publisher: Putnam Adult (March 16, 2006). Hardcover: 352 pages. Hannah, a perplexing mix of timidity and strength, must confront multiple personal demons in the course of the tale, and she does so with grace and savvy. Series: Hannah Smith (Book 1). And when a girl goes missing, and Hannah is asked to find her, that is exactly what happens.. .
New York (1993) First edition. SIGNED by Randy Wayne White on front end-paper. Near fine in near fine dj. (Light trace of foxing at top edge. Tiny soil spot on fore edge. Faint vertical stress crease on front board. ). THE MANGROVE COAST. ". New York (1998) UNCORRECTED PROOF. Fine in pictorial printed wrappers. CAPTIVA. ". New York (1996) UNCORRECTED PROOF. Near fine in pictorial glossy printed wrappers. (Faint crease at bottom right-hand corner of front cover. Slight trace of curling at upper tip of front cover) A Doc Ford novel. BONE DEEP: A DOC FORD NOVEL BY RANDY WAYNE WHITE . FIRST EDITION! LIKE NEW! DUST JACKET AND HARDCOVER IN EXCELLENT CONDITION! . HI FOLKS! . Author: Randy Wayne White. Title: BONE DEEP. Book has no writing, marks, or creases. Nicely signed by the author on the second page. An attractive copy. First Edition,with complete number line, in dust jacket, signed by the author. Lot of 2 Doc Ford Series Dead Silence & Deep Shadow. Randy Wayne White hardcover. Condition is Very Good. Shipped with USPS Media Mail. Mangrove Lightning (A Doc Ford Novel). Author: White, Randy Wayne. First Edition with full number line. In protective acid-free archival quality acetate cover. Release Date: 2017-03-21. Condition: Collectible: Excellent. Randy Wayne White. Author - Randy Wayne White. Hardcover Mystery 8 Novel Lot with Bonus Short Story. Type - Mystery Fiction Novel Lot. Hunter's Moon, Not signed, 1st / 2nd edition. Twelve Mile Limit, Signed and inscribedto Steve, 1st / 1st edition. Here are Dead Silence & Hunter's Moon, Doc Ford novels, by Randy Wayne White. These Putnam hardcover books are in very good condition with dust jackets, tight binding, and complete pages. With numberlines down to 1 (first printings).